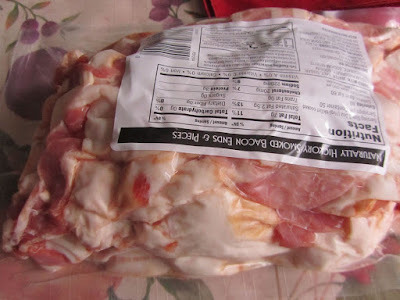 In yesterday's post, I mentioned buying bacon ends and pieces last month. I bought 6 lbs for under $2 per pound. Ends and pieces are just that, the ends and pieces when a large slab is cut for those nice, neat stacks of bacon. The portion of the hog, where bacon comes from, isn't perfectly rectangular, right? So, for packaging and presentation, the ends are trimmed off each side. The ends and pieces are packaged in a large lump of a pound or two, or up to 10 or 15 pounds, bought wholesale. Cash & Carry sells it as a "regular" item in 3-lb pouches (they occasionally get in large cases, as well). Bacon ends and pieces are the same as regular bacon, just not so prettily lined up in the package (instead in a smooshed lump), and of non-uniform size pieces. BUT, they are HALF the usual price per pound of that regular bacon. What I have found is that a package of ends and pieces has several nice, full-size strips, a few too-long strips, several half strips, and lots of just pieces. When I open a package, I sort the pieces according to how I'll use them. 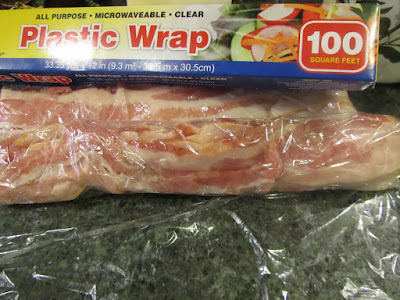 I first spread out 3 or 4 large sheets of plastic wrap onto the counter, and leave 2 or 3 square pieces of plastic off to the side (for wrapping up bundles, without having to wash hands in order to cut more wrap). I then begin pulling the bacon out of the package, and sort, as I go. I sort the pieces into piles: the perfect, save-for-special-morning pieces, the nice-but-too-long pieces, the half-size strips, the almost all fat pieces, and the very meaty smaller pieces. In a 3-lb package, about half of the pieces are in condition good-enough for breakfast strips (the perfect, the too-long, and the half-size strips). About 1/4 of the package is very fatty, and the last 1/4 is very meaty. Once all the pieces are sorted, I wrap in plastic wrap and keep in the freezer until I'm ready to use them/cook with them. 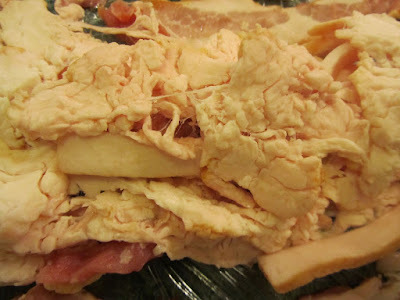 a pile of fat to render and make "cracklings"
As in buying regular bacon, inspect the package to see if the pieces look meaty. If not, skip to the next pack. I've seen ends and pieces at Trader Joe's, and understand that some other markets around the US also carry them (Winn-Dixie was one name, I remember). Cash & Carry sells them because this is what restaurants use for "seasoning bacon" and for making bacon bits. They reserve the long-strip bacon for breakfast sides. But I am using many of the ends and pieces as our breakfast side. It doesn't bother us that the pieces aren't all of the same length or look like mates to each other. 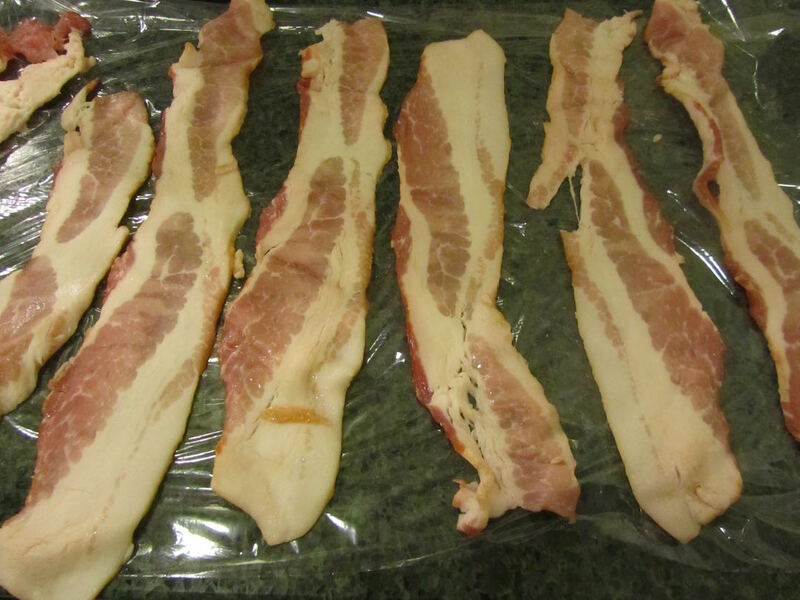 For those short strips in the package, there are times when a shorter strip of bacon is actually preferred, like on BLTs. What do you do when you go to assemble a BLT? You break each strip of bacon in half! And when I use bacon as a chopped and crumbled topping for items like baked potatoes or spinach salad, the size of each piece of bacon doesn't matter. So, in all, buying bacon ends and pieces is a win for us. The only, (and this is small), drawback, is the 20 minutes it takes to sort the 3-lb package. 20 minutes of my time yields a savings of at least $1 per pound. On a 3-lb package, that 20 minutes saved us at least $3. I didn't even bother to separate mine like you did. I did separate it into meal sized portions and put them in the freezer. One portion I kept out and placed as nicely as I could in a foil line 9 x 13 pan and baked until crispy. That was used for BLTs and nibbling and for eggs the next morning. Another small package was diced and put into a pan to fry for the start of a bacon/potato soup. We don't care if it's nice slices or mangled slices. Ours had a sweet taste but not sure what it was. AND IT WAS SO GOOD. I think we're going back for another package tomorrow because it makes such a nice start to a meal. 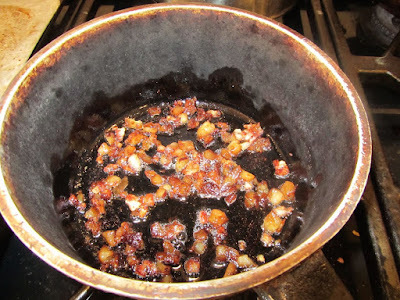 I also pour off the drippings once the bacon is cooked and save the grease for when I fry eggs for breakfast, I fry it in that to get the flavor of bacon. Or to fry onions in to start a savory meal starter. Can you share the name of the grocery store where you bought your package of ends and pieces? Not every store i our own area carries bacon packaged in this way, and your info could help someone else find the bacon ends and pieces. I love using the bacon fat for starting soups and stews (beef stew is awesome when started withe some bacon fat, and maybe a few small chunks of bacon). I also like to fry bean burger patties in the saved bacon fat. It adds "meaty" flavor to a bean dish. Would that be Horrock's in Lansing? I shopped there when I used to live in Lansing. even some of those ends and pieces could work for a guest luncheon, though. You could make a deviled ham spread with ham ends. And if you used small sandwich buns (slider buns) some of the ends might be big enough. Or if you made one or two large sub sandwiches, to cut into servings, those serving pieces are usually narrow enough that ends might work. And if I were your guest -- you could certainly serve ends and pieces to me!! So, maybe it depends on who your guests are! But I get what you're saying -- the presentation might not be as appealing if the sliced meat was laid out on a platter. 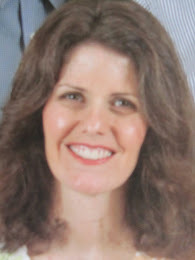 The Horrock's I went to is in Kentwood/Grand Rapids, Michigan. That is great information, I had never heard of bacon ends & pieces until I read your post yesterday. I will have to make sure to take notice & see if any stores in our area carry them. Thank You! You're welcome! Bacon ends and pieces is one of those almost "secret" savings tips that I don't see spoken of very often either. But for bacon at close to half price, it's so well-worth looking for. If you do find ends and pieces in a store near you, can you come back and post the store name, please? If I ever find them in my area I will let you know. Wow, what a tutorial, Lili! :) Awesome! Like Alice, I just separate into basically meal-sized/two-meal-sized portions; and take whatever I find when I open that section up. Since we don't mind the short pieces (especially the occasional 2x3 chunk of meat with no fat at all-- whoo-hoo! carnivores rejoice! ), and the "slices" tend to be a jumble, as you said, I usually just slice the whole package into 4 or 5 hunks, and freeze those as is. I never seem to have any trouble using it up. We used to get ours at Smart & Final, and Safeway sometimes used to carry it, too (don't know about now). Keep your eyes open, though, at any store. We've discovered a box now and then shoved in the bacon case at a store where we didn't think they normally carried it. Not sure if that happens as much now (seems all stores are so much more computerized and standardized than they used to be). I'll check our local Safeway the next time I'm there. I'm looking forward to a Winco opening in our area this coming spring, as I would expect that store to carry ends and pieces, as well. 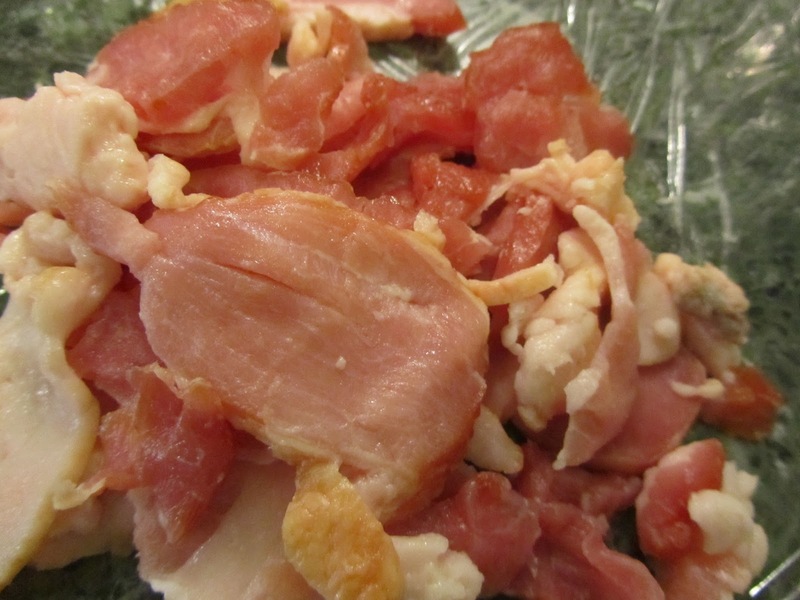 Trader Joe's carries the ends and pieces in uncured bacon, which may interest you, too. It's very good, applewood smoked, but no nitrates. I've been buying uncured "regular" bacon at Aldi's for a good price. I'm not by a Trader Joe's very often, but I'll have to check to see if they have some uncured ends and pieces next time I stop there. I've never seen bacon ends and pieces in any store. But then again, I haven't been looking. that's terrific that Aldi's carries the "uncured" bacon at a good price. In addition to Trader Joe's, if you have a butcher (not as part of a supermarket) in your community, you could also inquire if they ever have bacon ends and pieces. Some do. Bacon ends and pieces reminds me of the salmon scraps we buy for 99 cents per pound, the pieces of fish around the nice rectangle fillet pieces sold for 7x more, sitting right next to the scraps in the fish display. The only problem is the bones, but we're accustomed to eating small tropical fishes that have lots of even smaller sized bones. Yes! Same sort of thing, with your salmon scraps. The edible portion of a salmon doesn't grow in those neat little square and rectangular chunks! When Trader Joe's eventually expands to Hawaii, you'l have there to find the bacon ends and pieces. I just checked TJ's "opening soon" page, and sadly Hawaii isn't on it, yet (but they will be opening stores in Texas, Oklahoma, Alabama, Florida and Michigan, soon). Another parallel....we use the salmon frying oil (we gently fry (low heat) the salmon pieces in olive oil) and keep that oil to use in bean patties, much like frying bean patties in bacon fat. However, I find adding the oil to the bean mixture, then frying, less messy (no additional oil needed when frying, just a quick PAM spray to get the pan conditioned for the first patty). Thanks for that coupon code, YHF!!! I'll check that out. I sometimes do add oil to the bean mixture. Not always. But I'll try adding bacon fat directly in the bean mixture, for flavor. Thanks! Our Trader Joe's just opened up last week Friday (Grand Rapids, Michigan). We went but didn't go looking for bacon bits/pieces at that time. I'll look again when it is less busy. Not sure what "uncured" means. It might be healthy but my budget is so tight that if it costs more, I can't buy it. Is it still bacon then if it is uncured? Uncured bacon is actually cured. However, most of the time uncured means that nitrates were not used to cure it. Interesting, live and learn. Didn't know that! Alice, I don't recall how expensive/inexpensive Trader Joe's "uncured" ends and pieces are, but I do remember thinking they were a good buy. Same with the nitrate-free hot dogs -- much cheaper than Hebrew National's regular price, and nitrate-free. I know, most of time, I'm just wanting some flavoring, so buying whole strips of bacon, to just chop up does seem like a waste! I am craving spaghetti carbonara so much right now (that's what my dad used to make with ends and pieces growing up, also good for flavoring split pea and black bean soups). And you're right, any of the bean-based soups would be delicious with some bacony flavor, from ends and pieces. My family loves carbonara, so I started doing an easy-mix version for camping, etc., which doesn't require flour or eggs for a real 'sauce'. You can actually mix up a pretty decent carbonara or bacon alfredo if you melt butter in the noodles and then add Parmesan cheese and minimal milk and cook until melty. Or mix the milk with the Parmesan first, which reduces the chance of getting cheese clumps, though making sure the noodles are buttered first also helps reduce that. You can just not crack the egg in -- we've omitted that when we haven't had eggs. Some people use cream or milk instead. If you can't have cream but can have flour, you could toast some flour with the bacon and onions and then add water (or milk) to make a roux. The important thing really is the bacon. I'm down to my last 2 eggs. I use soy milk and heavy cream, also Parmesan. I'm going to try this for lunch tomorrow or Sunday. Sounds so yummy! And super easy! So, the 'best' bacon isn't the best for our home - we only buy eye bacon. Strips of bacon are not as common in Australia, I feel. I think the eye bacon is from the same place on a hog as what is referred to as back bacon in Canada, the loin. Does that sound correct? 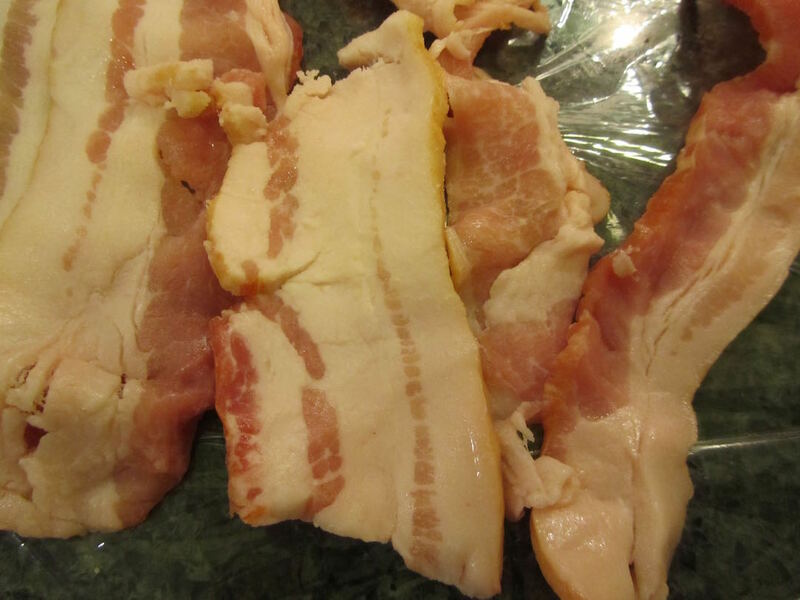 The streaky bacon, which is the common bacon in the US, is from the belly. I believe your eye bacon is a very lean cut, whereas strips of bacon, here are definitely fatty. Interesting contrast on what is called bacon. But even with the eye bacon, there's probably someplace that sells ends, and hopefully for less. How neat that you found some "perfect strips" in your bacon. And like you, we always break our bacon in half for BLTs, otherwise it hangs over the edge of the bread/toast. Great price too, btw. This one brand of ends and pieces usually has at least 1 family meal of "perfect" strips. I usually set those aside for a holiday breakfast, like Thanksgiving, Christmas and/or New Year's, or a birthday breakfast. And then there are enough "good" strips for 2 more family meals, including the half strips which work so well for BLT's or Welsh rarebit. I find these at our local Super Walmart (Southeastern US). Checked yesterday. 3# for $7.28. The brand is that of the "good" bacon here. It was half the price per oz the same brand bacon strips and about 1/3 cheaper per oz than the cheapest brand of bacon strips. Our other grocery stores (Sav-A-Lot and Piggly Wiggly) have them too. And our local butcher shop will save them if requested. Great information, Doc! Thanks for sharing. It will surely help someone!